Definition at line 445 of file detect.h. Definition at line 463 of file detect.h. Referenced by DetectDsizeRegister(), SigParseGetMaxDsize(), and SigParseSetDsizePair(). Definition at line 483 of file detect.h. 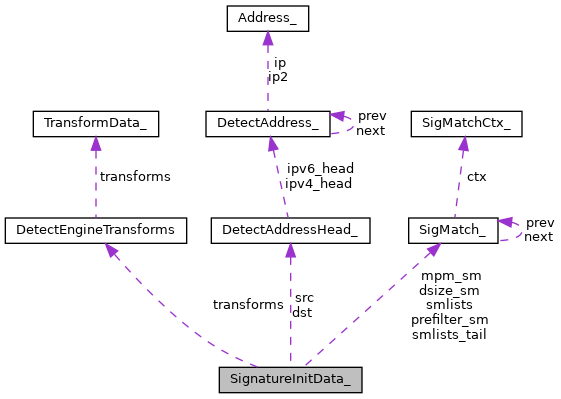 Referenced by DetectSignatureSetAppProto(), SigMatchList2DataArray(), and SigMatchListSMBelongsTo(). Definition at line 456 of file detect.h. Referenced by SigMatchListSMBelongsTo(), and SignatureIsIPOnly(). Definition at line 459 of file detect.h. Referenced by DetectEngineAppendSig(), DetectEngineAppInspectionEngine2Signature(), DetectFlowbitsAnalyze(), DetectFlowSetupImplicit(), DetectHttpClientBodyRegister(), DetectIPProtoRegister(), DetectIPProtoRemoveAllSMs(), DetectParseDupSigHashFree(), DetectSetupParseRegexes(), EngineAnalysisRules(), EngineAnalysisRulesFailure(), PacketCreateMask(), SigAddressPrepareStage1(), SigAddressPrepareStage2(), SigAddressPrepareStage4(), SigInit(), SigMatchList2DataArray(), SigMatchListSMBelongsTo(), and SignatureSetType(). Definition at line 471 of file detect.h. Referenced by DetectBase64DataRegister(), DetectBase64DecodeDoMatch(), DetectBufferGetActiveList(), DetectBufferSetActiveList(), DetectByteExtractDoMatch(), DetectBytejumpDoMatch(), DetectBytetestDoMatch(), DetectContentSetup(), DetectDceStubDataRegister(), DetectEngineContentModifierBufferSetup(), DetectGetLastSMFromLists(), DetectGetLastSMFromMpmLists(), DetectHttpResponseLineRegister(), DetectIsdataatSetup(), DetectLuaRegister(), DetectPcrePayloadMatch(), DetectPktDataRegister(), DetectRawbytesRegister(), DetectSignatureAddTransform(), DetectTemplateBufferRegister(), DetectTemplateRustBufferRegister(), SigAlloc(), and SigMatchList2DataArray(). Definition at line 472 of file detect.h. Referenced by DetectBufferGetActiveList(), DetectBufferSetActiveList(), and DetectSignatureAddTransform(). Definition at line 466 of file detect.h. Referenced by DetectAppLayerInspectEngineRegister2(), DetectEngineAppInspectionEngine2Signature(), DetectSetFastPatternAndItsId(), EngineAnalysisFP(), EngineAnalysisRules(), MpmStoreFree(), MpmStorePrepareBuffer(), PacketCreateMask(), PerCentEncodingMatch(), and RetrieveFPForSig(). option was prefixed with '!'. Only set for sigmatches that have the SIGMATCH_HANDLE_NEGATION flag set. Definition at line 451 of file detect.h. Referenced by DetectContentSetup(), DetectFileextRegister(), DetectFilemagicRegister(), DetectFilenameRegister(), DetectFlowvarMatch(), DetectPcrePayloadMatch(), DetectReplaceRegister(), DetectTlsRegister(), DetectTosRegister(), and SigMatchListSMBelongsTo(). Definition at line 485 of file detect.h. Definition at line 468 of file detect.h. Referenced by DetectPrefilterRegister(), EngineAnalysisFP(), EngineAnalysisRules(), and SigAddressPrepareStage1(). Definition at line 447 of file detect.h. Definition at line 489 of file detect.h. Referenced by DetectAckRegister(), DetectAppLayerEventPrepare(), DetectByteExtractRetrieveSMVar(), DetectContentPMATCHValidateCallback(), DetectContentPropagateLimits(), DetectDsizeRegister(), DetectEngineAppInspectionEngine2Signature(), DetectEngineContentModifierBufferSetup(), DetectFastPatternRegister(), DetectFlagsSignatureNeedsSynOnlyPackets(), DetectFlagsSignatureNeedsSynPackets(), DetectFlowbitsAnalyze(), DetectFlowFree(), DetectFragBitsRegister(), DetectFragOffsetFree(), DetectGetLastSMFromLists(), DetectHttpHHRegister(), DetectHttpMethodRegister(), DetectIcmpIdFree(), DetectIcmpSeqFree(), DetectICodeFree(), DetectIdFree(), DetectIPProtoRegister(), DetectIPProtoRemoveAllSMs(), DetectITypeFree(), DetectLuaRegister(), DetectSeqRegister(), DetectSetupParseRegexes(), DetectTemplate2Free(), DetectTlsFingerprintRegister(), DetectTlsJa3HashRegister(), DetectTlsSerialRegister(), DetectTtlFree(), DetectUrilenApplyToContent(), DetectUrilenValidateContent(), EngineAnalysisRules(), PacketCreateMask(), RetrieveFPForSig(), SigAddressPrepareStage1(), SigAddressPrepareStage4(), SigAlloc(), SigFree(), SigMatchAppendSMToList(), SigMatchList2DataArray(), SigMatchListSMBelongsTo(), SigMatchRemoveSMFromList(), SignatureHasPacketContent(), SignatureHasStreamContent(), SignatureIsIPOnly(), and SigParseApplyDsizeToContent(). Definition at line 487 of file detect.h. Referenced by DetectByteExtractRetrieveSMVar(), DetectContentPropagateLimits(), DetectEngineAppInspectionEngine2Signature(), DetectFastPatternRegister(), DetectFlowbitsAnalyze(), DetectGetLastSM(), DetectGetLastSMFromLists(), DetectGetLastSMFromMpmLists(), RetrieveFPForSig(), SigAddressPrepareStage1(), SigAddressPrepareStage4(), SigAlloc(), SigFree(), SigMatchAppendSMToList(), SigMatchList2DataArray(), SigMatchListSMBelongsTo(), and SignatureIsIPOnly(). Definition at line 491 of file detect.h. Referenced by DetectAppLayerEventPrepare(), DetectContentPropagateLimits(), DetectDnsQueryRegister(), DetectEngineContentModifierBufferSetup(), DetectGetLastSM(), DetectGetLastSMByListId(), DetectGetLastSMFromLists(), DetectGetLastSMFromMpmLists(), DetectUricontentRegister(), SigAddressPrepareStage4(), SigAlloc(), SigFree(), SigMatchAppendSMToList(), and SigMatchRemoveSMFromList(). Definition at line 455 of file detect.h. Definition at line 475 of file detect.h. Definition at line 474 of file detect.h. Referenced by DetectBufferGetActiveList(), and DetectSignatureAddTransform(). score to influence rule grouping. A higher value leads to a higher likelyhood of a rulegroup with this sig ending up as a contained group. Definition at line 480 of file detect.h.